Tecno has just added one more device to its list of devices. 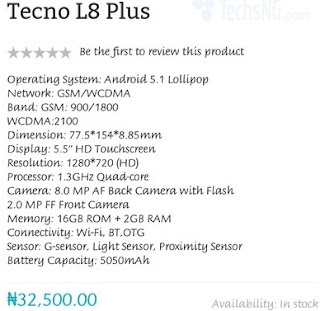 Tecno just recently released the new tecno L8 plus which happens to be an upgrade to the tecno L8. The new tecno L8 plus has a very similar Specification to its predecessor except for the larger RAM. The L8 plus is powered by the same 1.3ghz quad core processor, runs on Android lollipop 5.1 and also has the same 5.5inch HD display. But unlike the L8 that comes with 1gb RAM, the L8 plus has a larger 2gb RAM. 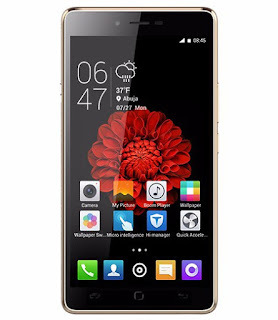 You can check tecno j8 full Specification from this link, you can also check the full Specification of the L8 plus from the image below. Considering the fact that this phone is a slight upgrade with a larger RAM, it is also a bit more expensive. For those who are interested, you can get the device at N32,500 only.